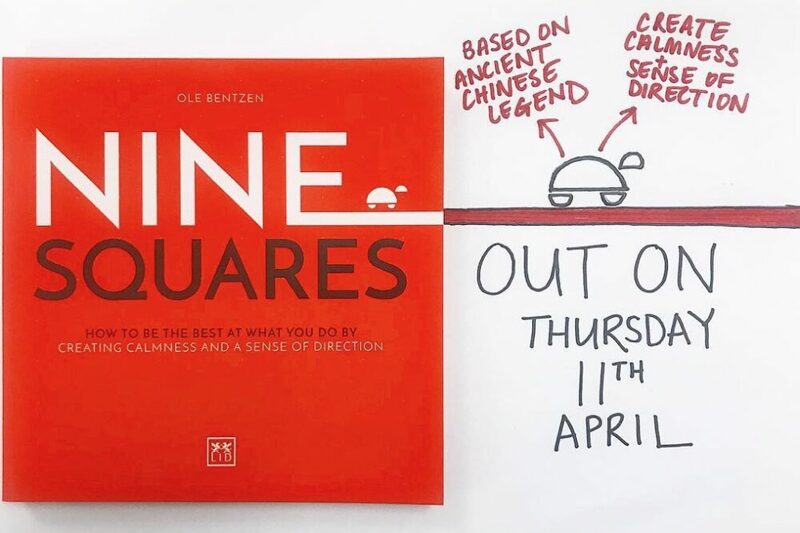 Nine Squares: How to be the best at what you do by creating calmness and a sense of direction by Ole Bentzen is publishing in the UK. Find out more about our latest book below. Vision, value, growth and well-branded acumen have, according to Ole Bentzen, never been more important than now where digitalization sets the agenda in the world of business. Nine Squares is a guidebook for leaders who wish to invest in their people as well as their customers. In order to succeed as a leader – creating calmness, having a sense of direction, communicating clearly and getting the right results is the key to your energy. The combination of these four strengths makes the core message of this guidebook. This model is to assist managers and businesses in getting back-on-track, remaining on track or getting ahead as a unique and innovative business with well-defined targets, vision, and brand. Based on an ancient Chinese legend, the Lo Shu story of the magic turtle, Nine Squares is a fresh approach to management theory and practices to thrive in contemporary digital chaos. The book draws inspiration from the Chinese master who read the patterns on the back of a turtle and saw a deeper pattern that was based on the natural balance of the universe; The Magic Square. This pattern inspired in-demand speaker and coach, Ole Bentzen, to create The Magic Square methodology which has been applied to his management, leadership and brand work over the last 40 years. It provides a formula which leads to results that are characterized by the sense of direction for which we each aim. The philosophy complies with nature’s system and at the same time, it provides direction in relation to being in balance with oneself, as well as one’s fellow human beings. “Nine Squares is an excellent guide to personal leadership. It equips you with the knowledge and skills that can help to drive ay business or relationship with passion, focus and a sense of calm. This is a book for any person who wants to become more effective in their career or personal life by being more focused and balanced. The author, Ole Bentzen, brings his personal life experiences of working for some well-known Scandinavian companies. Through his learnings, he has developed tools and processes that almost anyone can use to shape and take control of their destiny and become the best they can be. Personally, Nine Squares has enabled me to find my true passion and self-confidence and focus that helped to create my company, Nital Studio. It has empowered me to unlock my potential to collaborate and work for some well-known Scandinavian brands. I can highly recommend this book to anyone looking to focus their values and passion to be the best at what they do or live for.” – Nital Patel, Founder of Nital Studio and Head of Design at LIGHT-POINT Copenhagen. Ole Bentzen was CEO for Thiele, one of Denmark’s largest chains of opticians. Here he developed a management model “The Nine Squares”. Ole is now an in-demand speaker and coach in Europe and China.